"The city has passed the bread and butter stages and reached the intellectual zone of civilization," The Wichita Eagle proclaimed when the library opened in 1915. Now, thanks to a renovation from Fidelity Bank and two Wichita brothers, Clark and Clay Bastian, the old beaux arts building is back as a showpiece in Wichita architecture. 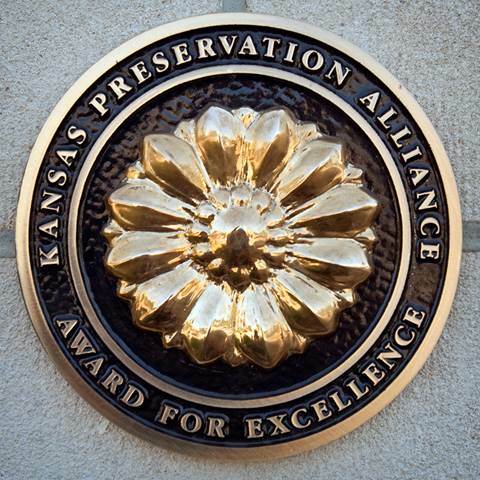 In June, the Kansas Preservation Alliance awarded Fidelity Bank its 2010 Award for Excellence for its work in preserving the Carnegie Library building, located on Main Street between William and English. In its heyday, the library was one of nearly five dozen Carnegie-funded libraries built in Kansas. Of that number, less than half remain today. The building was placed on the National Register of Historic Places in 1987. For nearly half a century, the Carnegie Library building in Wichita served as — well, a library. But by 1967, a newer, more modern library was opened across the street. The building underwent a series of use changes in the following decades — serving as a municipal court building, then as the Wichita Omnisphere & Science Center. Through each change, original stained glass windows, chandeliers, murals, and marble columns were removed, ceilings altered and portions of two floors were removed. When Clark and Clay Bastian — brothers and officers at Fidelity Bank — saw the building in 2006, it was drastically altered from the building Clark remembered going to as a boy to check out books. The Bastians were looking for office space. "We were out of space in our headquarters building," said Clark Bastian, Fidelity Bank chairman and CEO. "We had started to look elsewhere in the city to relocate." But right next door was the old Carnegie Library. "We were the logical user because we had our own parking lot," Clark Bastian said. "It made sense until we began looking at it, and then somewhere logic and passion got blurred and here we are." As much as possible, the Bastian brothers said they wanted to return the feel of elegance and grandeur to the old library building. "To me, the restoration is a seamless put-back to the building from what was taken," said Clay Bastian, president of Fidelity Financial Corp. "Not all of it was work. There was a lot of research we had to do." The brothers spent two months searching for two marble columns that once graced the rotunda. "We thought they had been stored in the basement of Century II," Clay Bastian said. The columns weren't there and were never found. So the brothers had local craftsmen create composite columns painted with a faux finish to match the existing columns. They searched local libraries for historical photos and documents that might show details of architectural features. A copy of the architect's plans were found at Wichita State University's Ablah Library . A tar-covered chandelier globe found in the attic provided clues as to the size and dimensions for reproduction chandeliers. For nearly three years, the building was under renovation. "This building was under construction almost as long as it was under renovation," Clark Bastian said. "Windows had been plywooded over and spraypainted black." Although they won't say how much money they put into the renovation, Clark Bastian said it cost enough to have built "two and a half branches." Every detail in the building was turned back in time, except a new heating and air conditioning system in the basement; a new elevator, and a new artist to create murals for the second floor. "My heart ached for there to be something to capture the attention like those original murals did," Clark Bastian said. 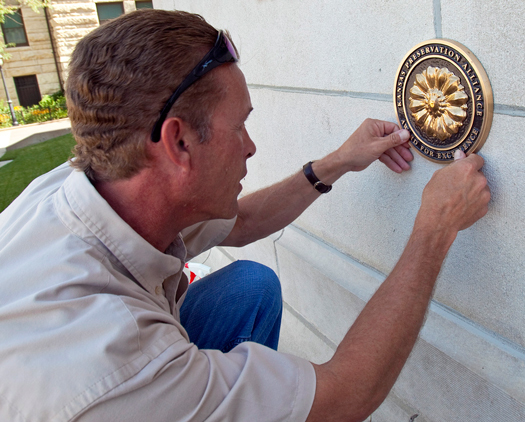 The brothers commissioned Bryan Haynes, a St. Louis artist, to create a sense of history and legacy for Wichita. Haynes created two paintings: the "Ride of the Four Horsemen," depicting the moment when four Wichita leaders rode out to meet drovers along the Chisholm Trail to encourage them to bring their herds to Wichita rather than nearby Park City; and, the "Treaty of the Little Arkansas 1865," featuring Old West leaders such as Kit Carson, Cheyenne Chief Black Kettle and Jesse Chisholm at the signing of the treaty near Wichita. Both scenes were turning points in Wichita's history.